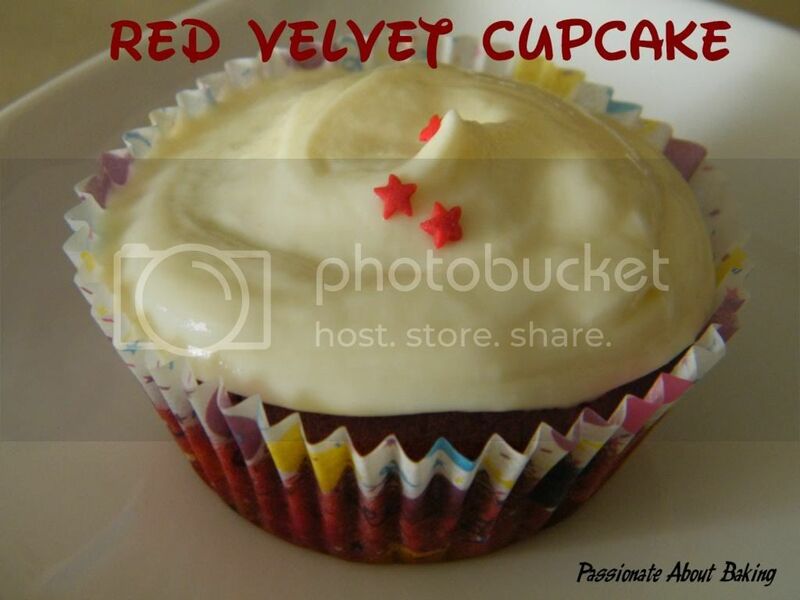 As 2012 comes to an end, I reviewed my 10 best (and new) bakes for the year. 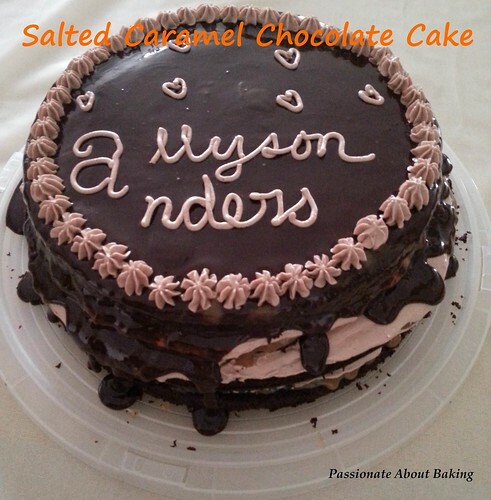 I hope with this review, I will be able to do more new bakes next year. 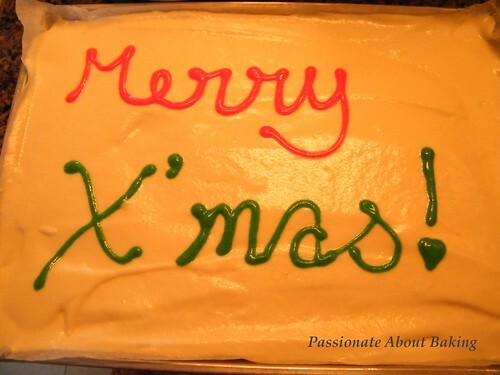 Looking forward to a better baking 2013! Happy 2013 and beyond! Christmas is my favourite festive season of the year. It is a period where there will be lots of feasting and gathering. I love to host Christmas gathering with family members and friends too! This year, I invited my family members and in-laws over to my place (separately) for a mini celebration. 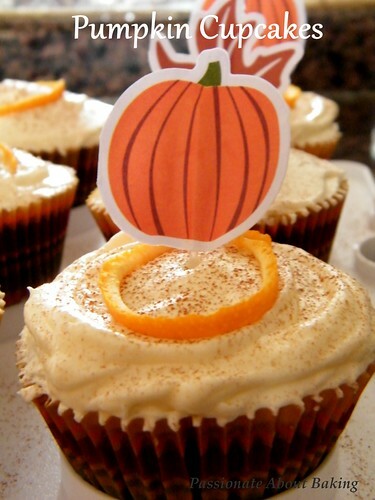 For occasions like this, I will usually bake some kind of desserts. 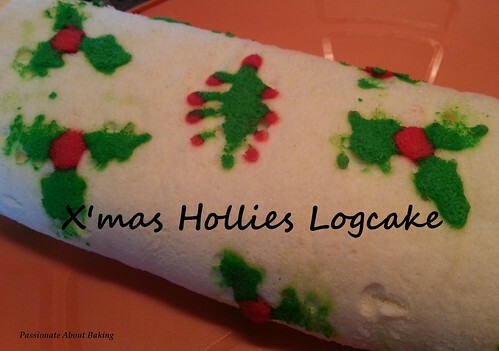 And one of the common desserts will have to be Christmas logcake. 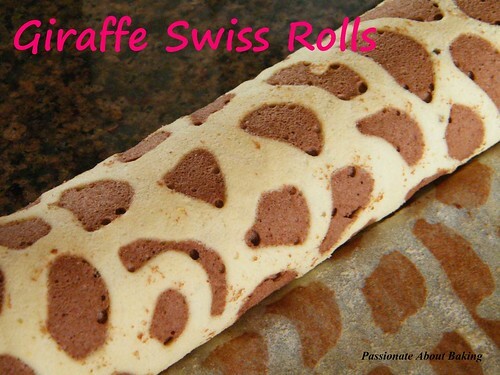 Ploughing through the patterned swiss rolls recipes in the blog, I decided to try this recipe from Reese. As I wanted to make two log cakes, I increased the quantity of the ingredients. I made one with strawberry jam and the other with durian. The durian logcake was very well received by my in-laws! I was glad they enjoyed it! 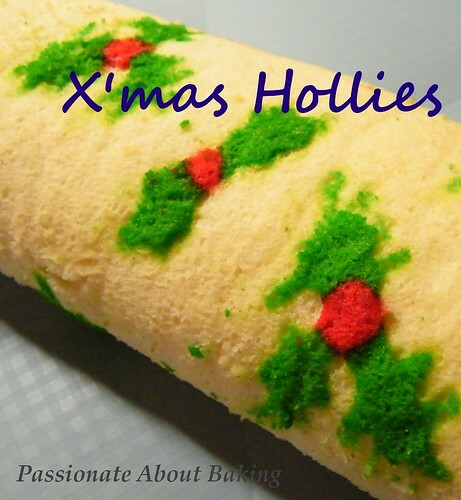 I am submitting this post to Aspiring Bakers #26 - Creative Christmas Motif Bakes! hosted by Alan of Travellingfoodies. 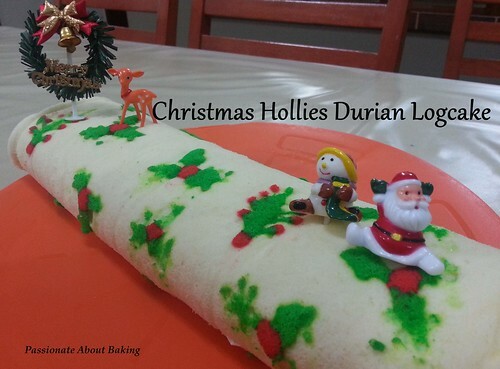 Recipe for Christmas Holly Durian Logcake, adapted from Reese. 1. Egg yolk batter: Whisk egg yolks together with sugar, then add in milk and oil and mix well. 2. Add in cake flour and cornflour and stir well. Set aside. 3. Scoop out 30g egg yolk batter with 10g (for red) and 20g (for green) respectively. 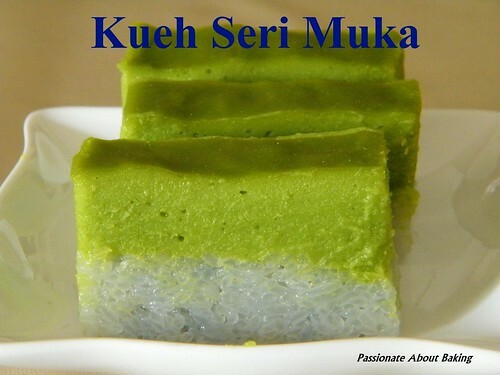 Mix in red colouring to the 10g batter and green colouring to the 20g batter. Mix well. 4. Whisk the 20g egg whites and sugar (ingredients for pictures) till half soft peak form and add 1/3 in the prepared 10g red egg yolk batter, and remaining egg whites in the green yolk batter. Stir well. 5. Spoon the red batter into a piping bag with tip #3. Pipe 3 rounds to form a little triangles onto lined tray. 6. Spoon the green batter into a piping bag. Cut off the tip and pipe it to form a leaf. Pipe three leaves around the red triangle. 7. Bake at 180C for 1 minute then set aside. 8. Egg whites: Whisk the egg whites together with the sugar until stiff peak. 11. Transfer onto wire rack to cool completely. 12. Whisk the whipping cream with sugar till stiff. 13. 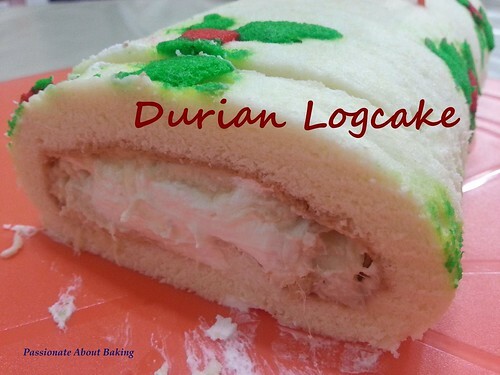 Spread the durian flesh onto the swiss roll, followed by whipped cream. 14. 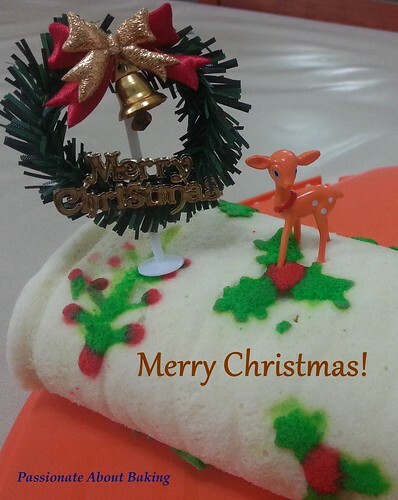 Roll it up and decorate with Christmas decorations. Wish you a Merry Christmas & a very Happy New 2013! I asked my daughter what she would like for her birthday cake. She didn't know what to request for. Lately she has taken a liking to mocha. So I suggested the mocha checkered cake for her. She was agreeable. 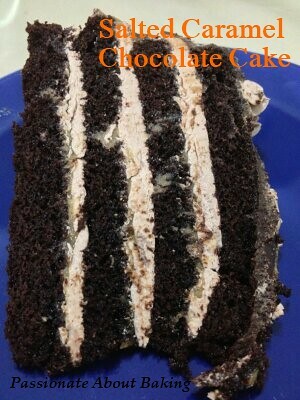 However, after much thought, I decided to do a different cake even though I knew the mocha cake will be well received. I decided on Martha Stewart's Salted Caramel Six-Layer Chocolate Cake. As I do not possess two 9" cake pans, I made one in 9" and another in 8". And instead of six layers, I only have 4 layers. I didn't follow the recipe totally. 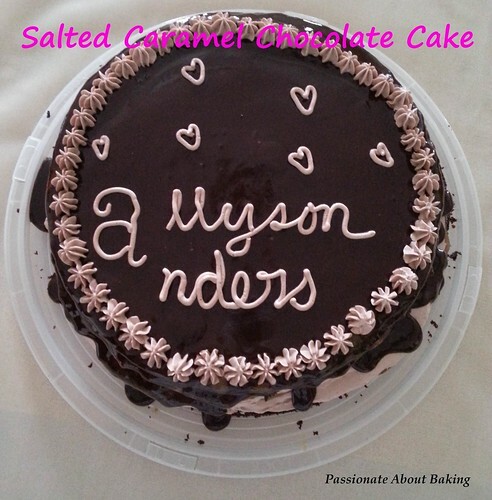 I added buttercream and chocolate ganache and didn't frost the whole cake. The cake was really unique and special with the salted caramel taste. The chocolate cake was really moist and dense. Most of us like the sweet & salty taste including myself. 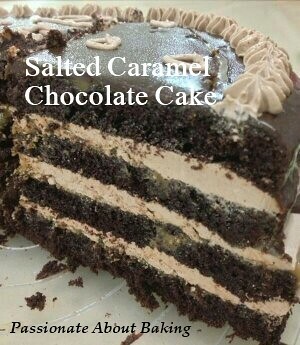 Recipe for Salted Caramel Chocolate Cake, adapted from Martha Stewart site. 2. Sift flour, granulated sugar, cocoa, baking soda, baking powder, and salt into the bowl of a mixer. 3. Beat on low speed until just combined. Raise speed to medium, and add eggs, buttermilk, cups warm water, oil, and vanilla. Beat until smooth, about 3 minutes. 4. Divide batter among the prepared pans. 5. 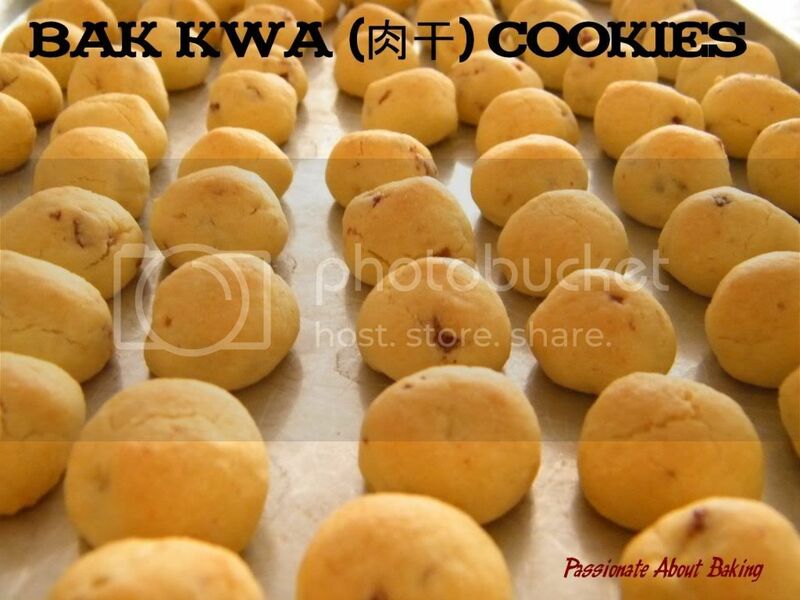 Bake until cakes are set and a toothpick inserted into the center of each comes out clean, about 35-40 minutes. 6. Let them cool in the pans on a wire rack for 15 minutes. Then turn out the cakes onto the wire racks, and cool completely. 7. Combine granulated sugar, corn syrup, and water in a medium saucepan over high heat. 9. Remove from heat, and carefully pour in cream (mixture will expand and spatter); stir until smooth. 11. 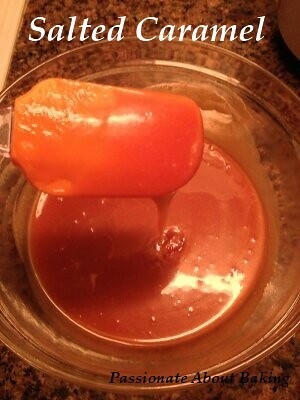 Pour caramel into a medium bowl, stir in 1 teaspoon coarse salt, and let it cool slightly, about 15 minutes. 12. Stir in the butter, a little at a time. Let it cool completely. 13. 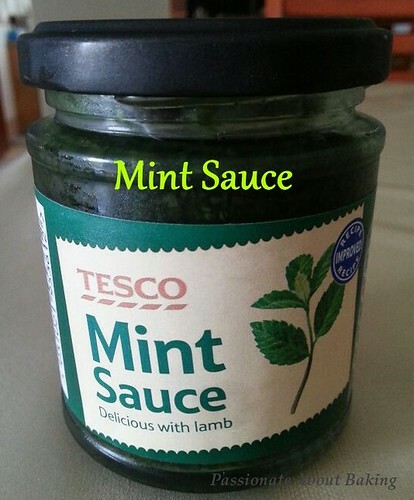 Refrigerate at this stage if you are not using immediately (just like me). 14. Whisk the egg whites and sugar over a double boiler until sugar has dissolved. 15. 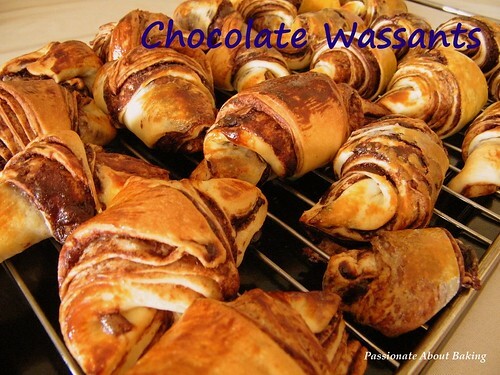 Remove from heat and whisk continuously until it's cooled and the peaks are stiff and glossy. 16. 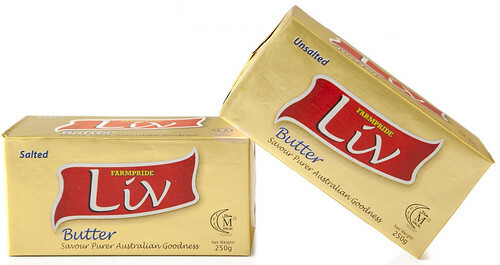 Add the butter in 3 batches, ensuring that it is well incorporated before adding another batch. 17. 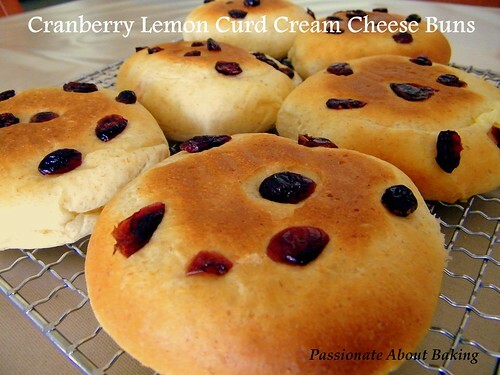 Continue beating until it becomes creamy and fluffy. 18. Lastly, sift in the cocoa powder and continue beating until the buttercream is uniformly smooth and chocky. 19. Heat whipping cream in a saucepan over low heat. Do not let it boil. 20. Before it boils, remove from the heat and pour over the chopped chocolates in a large bowl. Let it sit for 5 mins. 22. 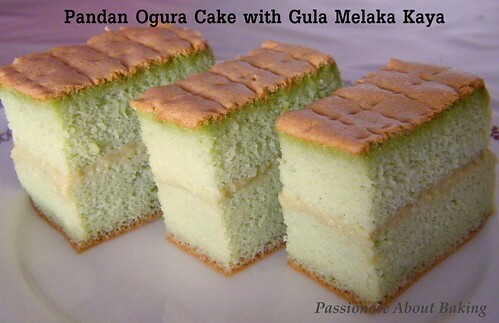 Cut each cake in half horizontally to form 2 layers. 23. Transfer 1 layer to a serving platter, and spread caramel generously over the top. 24. Add chocolate buttercream and spread evenly. 25. 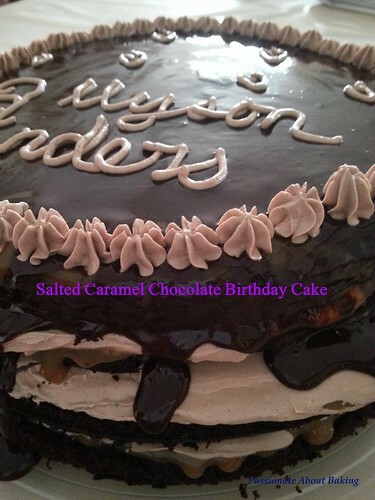 Top with another cake layer, and repeat with remaining caramel, buttercream and cake layers, with the top layer only covered in caramel. 26. Refrigerate until set, about 1 hour. 28. Decorate the top as desired. 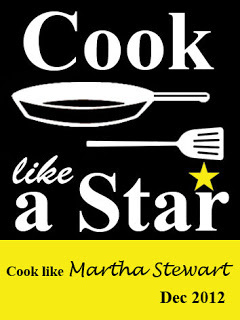 I'm submitting this for this month's Cook like a Star, Martha Stewart, organised by Zoe from Bake for Happy Kids, Baby Sumo from Eat your heart out and Riceball from Riceball Eats. Planning for a mini celebration is not easy. You always have to decide if you want to buy from store or made everything from scratch. If you're going to make everything from scratch, then it will mean early preparation of everything. However, some food cannot be prepared in advance. It needs to be prepared only when guests arrived. So when you don't have an extra hand, avoid making such foods, cos you really want to spend time with your guests instead of slogging in the kitchen right? I invited my family members over to my place for a simple birthday celebration for my "Little Twins Stars". 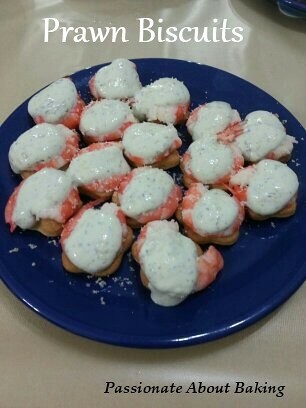 After thinking for a long time, I decided to make some finger food. A little special from the usual dinner I have with my family. This will be the one-bite food which I think they will like. 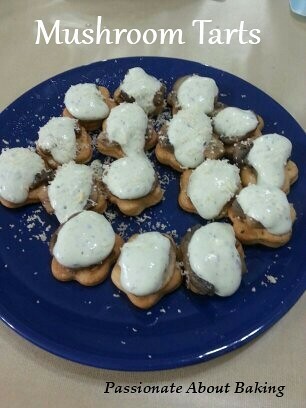 Using the same pastry base, I made them into Egg mayonnaise, prawns and mushrooms with sour cream mint. It was a delight to know that they loved the finger foods! Even the helpers like them and finished them all! So for future events, finger foods will be here to stay. Good that I can always make the pastry way before the event! 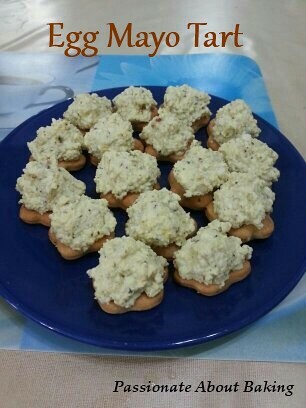 Recipe for Egg Mousse Tarts, extracted from Irresistible Pastry by Alex Goh. 1. Mix the butter with the flour until crumbly. 2. Add in parsley and water. 3. Mix to form a dough. Shape it into ball and press it flat. Wrap with plastic and refrigerate for at least 30 minutes. (I left mine overnight). 4. Roll out the pastry between two sheets of plastic wrap to about 3mm thickness. 5. Cut it with a cookie cutter (your preference of any shape). 6. Place the cut-outs onto a greased pan. 1. Mash the eggs finely and mix it with mayonnaise, pizza topper, black pepper and salt until well blended. 2. Scoop them into the pastry base and serve. For Prawns and Mushrooms, cook them separately. 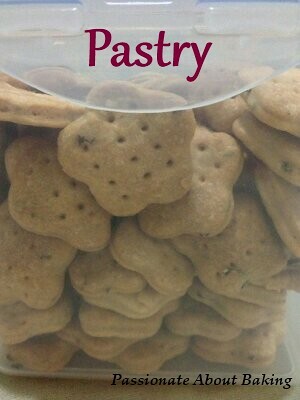 Place them individually on the pastry base. Then topped with mint sour cream. Mix well and place on top of prawns and mushrooms. 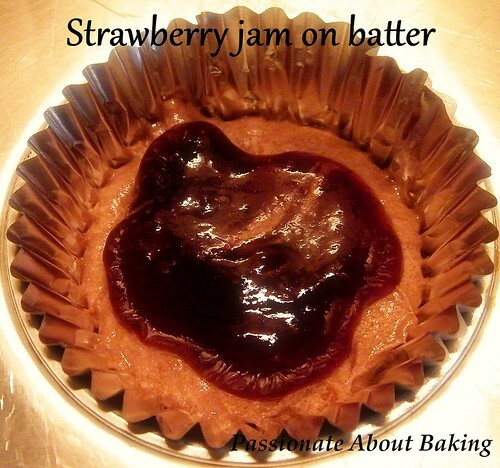 I've seen many bakers adding jam to their cupcakes in some of the blogs. It looked rather interesting though. So I decided to try baking some myself, to have a taste of how it's like. Since owning "Fabulous Cake Business" for quite a while, I didn't have the opportunity to try any recipes from this book. 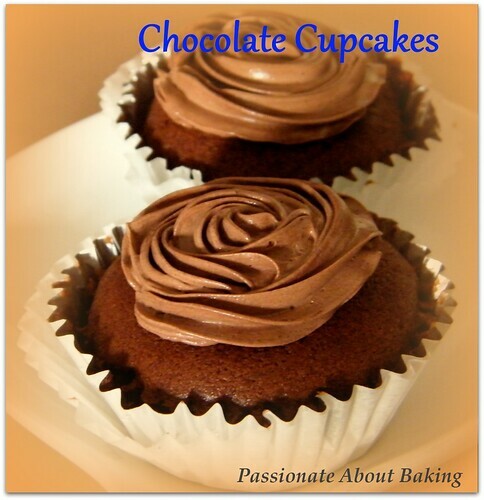 Therefore, I decided to modify one of their recipe - Blueberry Cupcake to bake my Strawberry Surprise Chocolate Cupcakes. 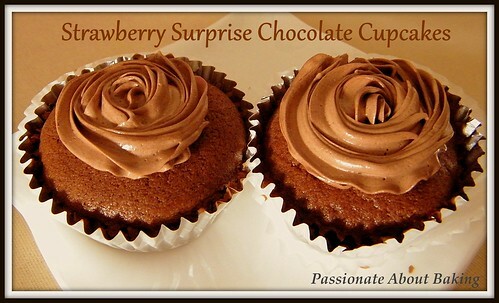 Recipe for Strawberry Surprise Chocolate Cupcakes, modified from Fabulous Cake Business by Alex Goh. 1. Beat (A) with a k-beater at medium speed until light and fluffy. Stop to scrap the sides and bottom of bowl with rubber spatula frequently. 2. Add (B) and cream until well blended. Gradually add (C) in 4 batches and cream until light and smooth. Stop to scrap the sides and bottom of bowl after each addition. 3. Add (D) and (E) alternately and mix at low speed until well blended. 4. Line the muffin moulds with the paper cups. 5. Scoop a small amount of the batter into the cups, then add a small teaspoon of the strawberry jam into the batter. 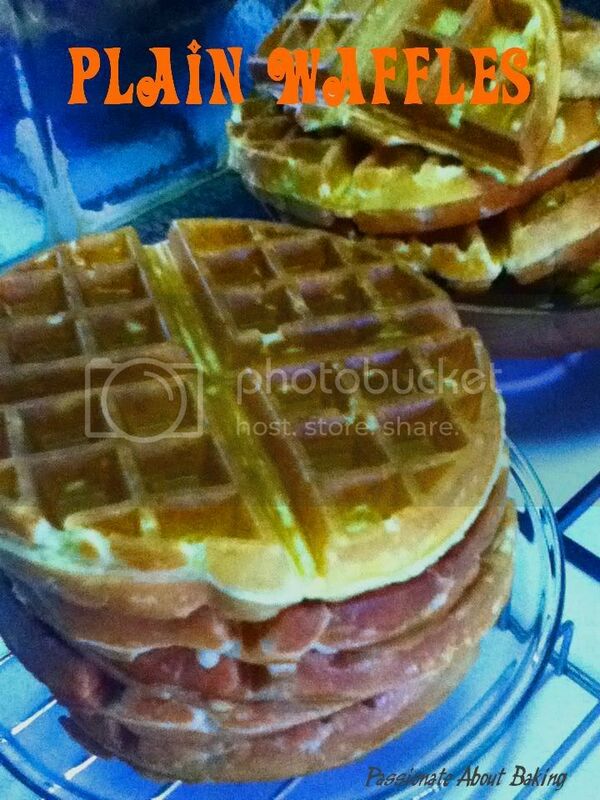 Topped it up more batter and smooth the top. 6. Bake at 190C in the middle rack for 20 minutes. 7. 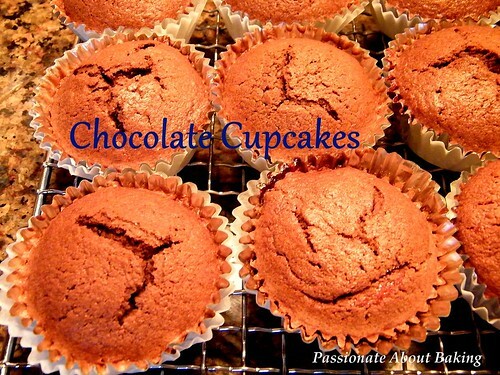 Remove the cakes from the moulds immediately after baking and set aside to cool. 8. Decorate it by piping chocolate buttercream on top of the cake.